A little retro flair goes a long way on the Nissan sports car duo. Though its design is growing old, the 2019 Nissan 370Z remains a potent performer as nimble as it is good looking. The Nissan of today is all about value. Nissan provides an opportunity to spruce up the 2017 370Z with some 2018 styling cues with its Heritage Edition. Here's a hilarious behind-the-scenes detail you never knew about. The formula for building an enthusiast-oriented coupe is pretty much set in stone. Team a stiff, rear-drive platform to a nimble suspension, add a powerful engine and slick-shifting manual transmission, and finish it off with a modern cockpit as comfortable as it is functional. 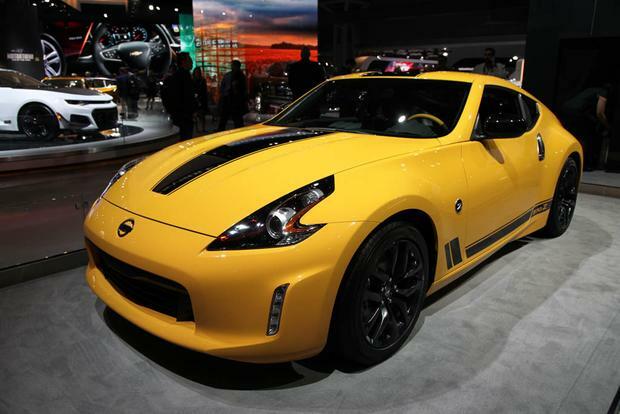 In the 2017 Nissan 370Z, this formula is tweaked to perfection, creating one of the last affordable rear-drive, 2-seat sports cars on the market. Fans of open-air driving will love getting their weekly dose of vitamin D behind the wheel of a convertible 370Z Roadster. Featuring all the athleticism of the 370Z Coupe, the Roadster goes one step further, with a power operated soft top that can be dropped in just 20 seconds. If the standard 370Z isn't powerful or sticky enough, buyers have the choice of the even edgier 370Z NISMO, which offers greater power from under the hood, a much firmer suspension, upgraded brakes, aero body enhancements and larger wheels. If track days are your cup of tea, the NISMO Z is an excellent choice. The 2017 Nissan 370Z is powered by a 3.7-liter V6 that produces 332 horsepower and 270 lb-ft of torque. This engine is managed by either a 6-speed manual gearbox or a 7-speed automatic transmission with steering-wheel-mounted paddle shifters. 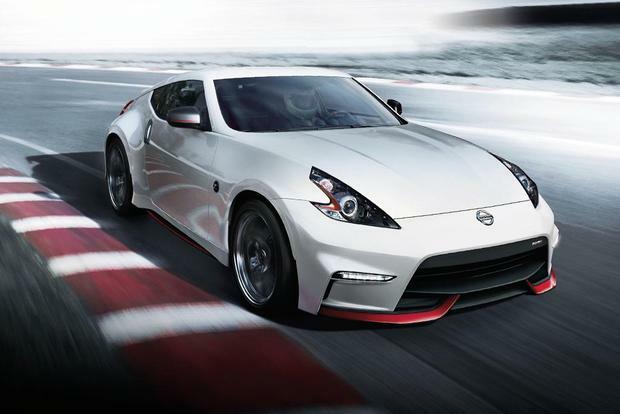 The 370Z NISMO uses a revised version of the same V6 engine, with output bumped to 350 hp and 276 lb-ft of torque. The NISMO can also be equipped with a choice of a manual or automatic transmission. Fuel economy for the 370Z is 18 miles per gallon in the city and 26 mpg on the highway with the manual and 19 mpg city/26 mpg hwy with the automatic. The Roadster yields 18 mpg city/25 mpg hwy with the automatic and 17 mpg city/25 mpg hwy with the manual. The NISMO yields 18 mpg city/26 mpg hwy with either transmission. The 370Z Coupe is available in base, Sport, Sport Tech, Touring, NISMO and NISMO Tech trims, while the Roadster is offered in base, Touring and Touring Sport. The 370Z Coupe ($30,855) includes Nissan's Intelligent Key with push-button start, power outside mirrors, windows and locks, a rear window defroster, cruise control, a tilt steering wheel, 18-inch wheels, steering-wheel audio controls, HID headlamps, Bluetooth and a 4-speaker AM/FM/CD stereo with an auxiliary input jack. The 370Z Roadster ($42,685) adds a power retractable soft top with a glass rear window and power top operation via the Intelligent Key remote fob. 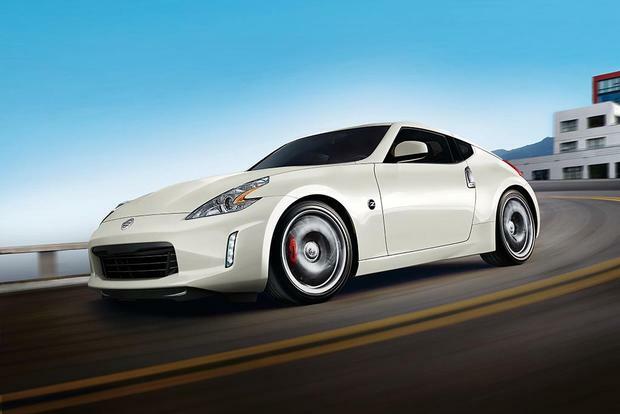 The 370Z Sport ($34,435) adds larger front and rear ventilated rotors, red brake calipers, a sport-tuned suspension, higher-ratio power steering, Rays 19-in alloy wheels, a limited-slip rear differential, heated outside mirrors and aluminum trim pedals. The 370Z Sport Tech ($37,935) adds a 240-watt Bose audio system with six speakers and two subwoofers, hard-drive navigation with a 7-in touchscreen, NavTraffic, NavWeather, streaming Bluetooth audio and a rearview monitor. The 370Z Touring ($38,835) adds leather and synthetic suede seats, a power driver's seat with adjustable lumbar support, a 4-way power passenger seat, heated front seats, 240-watt 6-speaker Bose audio, hard-drive navigation, HomeLink, a rear cargo cover and aluminum-trimmed pedals. 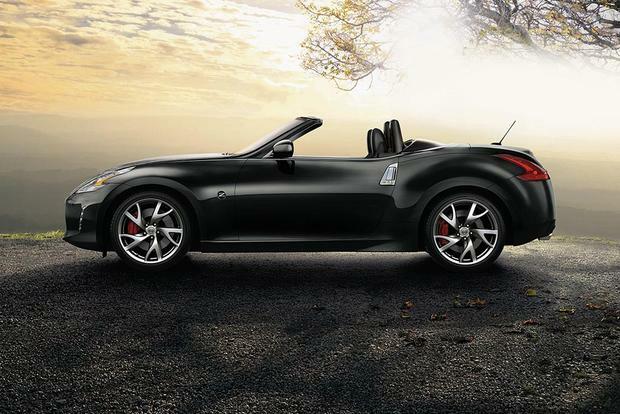 The 370Z Touring Roadster ($46,135) includes all the features on the Touring, plus the power soft top. 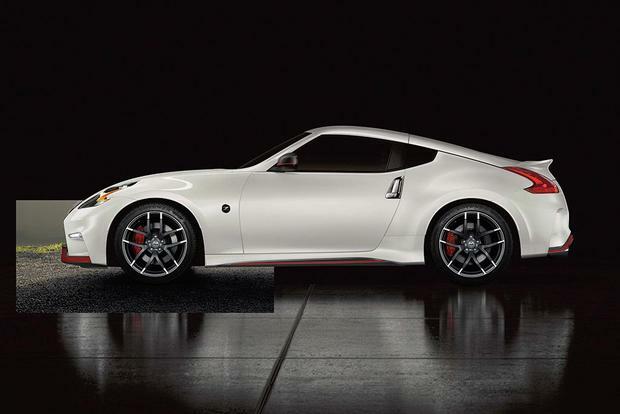 The 370Z Touring Sport Roadster ($48,965) adds the upgraded brakes, suspension, steering and wheels from the 370Z Sport. The 370Z NISMO ($42,855) adds a more powerful engine, 19-in Rays wheels, a 6-speed manual transmission with rev-matching technology, red-and-black leather-appointed Recaro-inspired seats with Alcantara faux suede inserts, exterior and interior cosmetic upgrades, and an extended front nose with an integrated chin spoiler. The 370Z NISMO Tech ($46,355) adds the Bose audio and navigation setup, as well as the rearview monitor. An automatic transmission adds $1,300 to the bottom line. 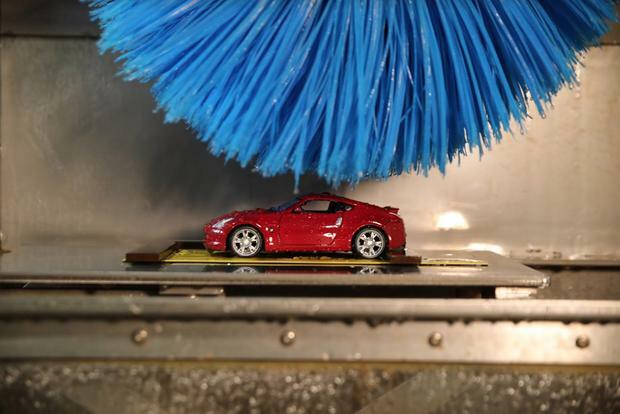 Options for the 370Z are limited to some dealer-installed features, including splash guards, carpeted floor mats and the Aerodynamic Kit (a rear spoiler and front wind deflector). Safety features for the 370Z Coupe, Roadster and NISMO include anti-lock brakes, stability control, active head restraints and six airbags -- front, side and head-curtain. Because the Roadster has no roof, its curtain airbags are deployed from the top of the door frame. Neither the National Highway Traffic Safety Administration nor the Insurance Institute for Highway Safety has crash-tested the 2017 370Z. Thanks to its strong engine and quick-shifting transmissions, the 2017 Nissan 370Z provides an abundance of power and acceleration. There's no shortage of straight-line performance here. The Z will impress you both off the line and on the open road. With the SynchroRev Match feature (NISMO), the performance experience is deftly elevated. The real magic happens when the Z's sport-tuned suspension is put to its paces at high speeds through tight corners. Whether on sharp canyon switchbacks or a super-curvy racetrack, this car exhibits gobs of grip and virtually no body lean. Its blend of agility and balance inspires tremendous confidence. If you push the Z extra hard, the stability control will likely step in to spoil the fun, but this system can be shut off if you really want to test the limits. What you'll learn, however, is that these limits are not easily reached. The 370Z Roadster's driving experience is about the same as the coupe's, but with a lot more wind in your hair. The NISMO takes the performance factor up a notch. This model is actually more appropriate for a track than for normal roads, as it's a bit rigid for everyday driving. There's not much sense in buying one unless you have the time and inclination for weekend trips to the track. Aside from its commendable sporting performance, the regular Z is still a fine car for the daily commute. Its ride is compliant enough to comfortably get you where you're going. 2017 Chevrolet Camaro -- The Camaro in V6 form is not as nimble or track-capable as the 370Z, but it's the more muscular straight-line performer. 2017 Audi TT -- The TT has a better balance of ride and handling and a more sophisticated overall package, but the 370Z has more cornering prowess, power and grip. Both offer extremely precise steering. 2017 Ford Mustang -- The Mustang a worthy competitor to the 370Z, offering excellent track skills, power and performance at a much lower base price. Used Porsche Cayman/Boxster -- The 2010-2015 Porsche Cayman coupe and Boxster convertible are midengine sports cars that offer better handling, as well as the exclusivity that comes with the Porsche name.